Easy: It is not complicated at all and you can do it in stages. Fresh Flavor: There is nothing like the flavor of fresh butter – cultured or otherwise. The fact that it is cultured just improves that flavor. Pure: Because you made it yourself, you know exactly what is in it. Crème Fraîche: Half way through the steps, you have made crème fraîche. So if you get lazy and don’t finish, you still have something delicious to use. Real Buttermilk is the Byproduct: You also get rich (real) buttermilk in the butter-making process and that is incredible in baked goods, ranch dressing, etc. It is pretty simple. Remember my post on making yogurt at room temperature? Well to make cultured butter, it starts with the same basic process except you use cream instead of milk. A scoop of yogurt or buttermilk is added to whole cream and it sets (cultures) at room temperature for 12-24 hours. At that point…Ta-Da! You now have crème fraîche. Salt is added and you are done! What Cream Should You Use? You get the best results when you use good quality ingredients, so buy a good cream. Look for the words heavy cream or whipping cream. It can be pasteurized, but not ultra-pasteurized. I recommend organic, of course. To start your culture, you need a few spoonfuls of active plain yogurt or buttermilk. 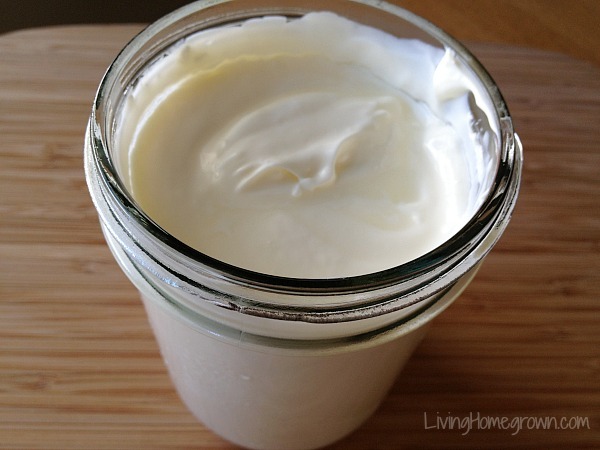 Homemade yogurt: I used homemade heirloom yogurt to start my first butter culture. It is a mesophilic yogurt that cultures at room temperature, so I figured I would get great results. (I did.) But any homemade yogurt will work. You can buy cultures for homemade yogurt here. Store Bought yogurt: You can also use regular store-bought yogurt. Make sure it has no preservatives, no gums and the least amount of additives. Go organic if you can and stick to plain yogurt with no flavoring. Cultured Buttermilk: You can also use real cultured buttermilk (usually found at whole food type stores or use homemade) to start a butter culture. Buy organic if possible. It can be pasteurized but not ultra-pasteurized (or it won’t work). Place your cream in a clean, 2-quart jar (or smaller jar if you are cutting down the recipe). Add the yogurt or buttermilk and stir well. Cover the jar with a coffee filter or tight-weave cheesecloth and hold the cover in place with a rubber band. Set the mixture in a warm spot in the kitchen. (Preferably around 75 degrees F). If your kitchen is cold, set the jar on a VCR or cable box or other electronic device that is slightly warm. Check the mixture at 12 hours to see if it has set. The warmer the room, the faster it will culture. When done, the culture will pull away from the sides of the jar. If it is not done, keep checking back every 4 hours or so. It can take up to 24 hours for the mixture to fully set. When the cream is cultured (and pulling away from the sides), place it in the refrigerator for a few hours to cool it down and stop the culturing process. At this point, you now have crème fraîche. You could stop here and use it as you would an extra rich sour cream. But instead, we are going to whip it up to remove the buttermilk. Note: If you get busy, you can stop at this point for up to 3 days before whipping up your butter. When you are ready, remove your jar from refrigeration for 1-2 hours to warm up a bit before moving on below. Scrape the cultured mixture into large mixing bowl and use either a hand-held or standing mixture to whip it. I suggest you use a standing mixture if possible because the buttermilk tends to splatter out while mixing. You can cover the standing mixture with plastic wrap and keep your mess at a minimum. It only takes 3-5 minutes and the mixture goes from a whipped cream consistency to yellow curds (butter) mixed with milky buttermilk. 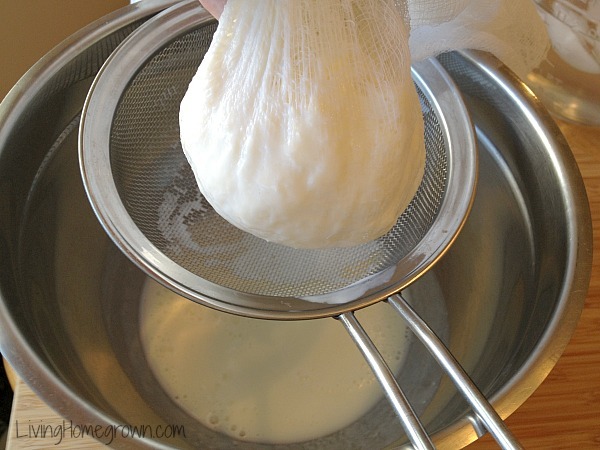 Line a strainer with cheesecloth and strain the mixture, reserving the drained liquid. This liquid is your buttermilk. Pour the buttermilk into a clean jar, cover and refrigerate. You can use it in bread, pancakes, waffles, ranch salad dressing and many other yummy things. Now, you need to wash the remaining buttermilk out of the butter. (It is important to get all the buttermilk out or the butter will go bad fairly quickly.) To do this, place the drained butter into a large bowl and pour about a half-cup of ice water over it. Use a wooden spoon, spatula or even a sauerkraut masher to squish the butter. As you press, the buttermilk comes out. Drain off and discard the water/buttermilk used to wash (it’s not worth saving) and repeat the washing process about 4 times or until the water stays clear. It takes about 4-5 minutes to do this. If you want to, you can now add your salt and mix it in. 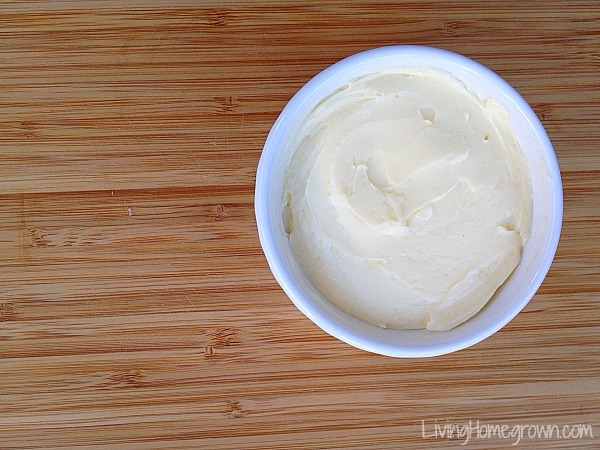 Place the finished butter in a ramekin, cover with plastic wrap or a lid and store in the refrigerator. It should last at least a month this way. Or you can freeze it for about 4-6 months. Fun, right? 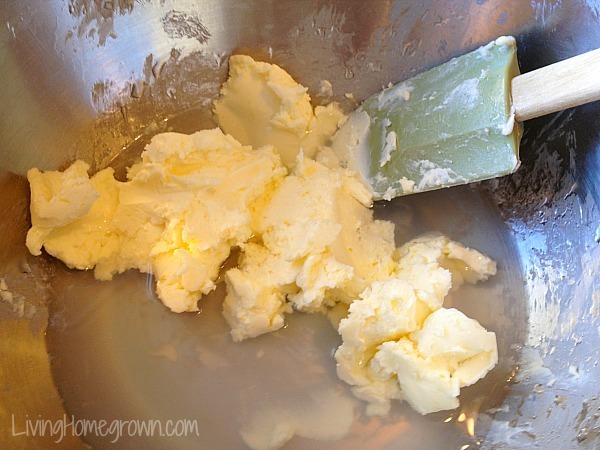 Are you going to try making cultured butter? I have both buttermilk and fil mjork (pretty sure I spelled that wrong) to start with. which do you think would be better? Also do you think I could use my vitamix instead of a mixer or would that just mix it even more thoroughly rather than separate it? I think the Filmjok or the buttermilk should both work equally well. Your Vitamix would be fine to use because the lid would keep the buttermilk from splattering. The only problem would be in getting the butter out of the blade area. But you can do it. Also, don’t mix in the Vitamix too long or it will warm up the butter. I say, go for it! I can’t wait to try this. We go through butter fast at my house (with 4 kids, every food item goes fast). I would much rather have homemade cultured butter available. Thank you for this recipe! We’ve been using the countertop-yogurt recipe you posted last month and the kids are loving it. Oh how much fun! I have been making home made crème fraiche for years and I actually have some in the frig right now. 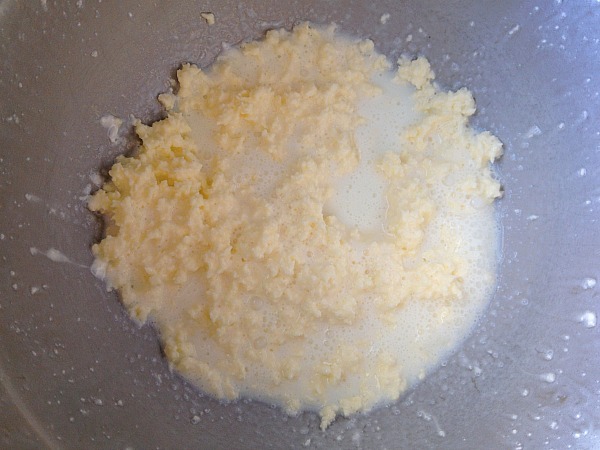 — Just made my first “cultured butter”. It was fun and easy. Looking forward to breakfast tomorrow morning with homemade biscuits and our homemade cultured butter. Thanks so much for your blog and wonderful recipes. So… I have to admit that I have never heard of cultured butter before, but now I can’t wait to try it! Thanks for the tutorial. Oh yeah! I’m making this ASAP (which unfortunately means I’ll have to wait until the weekend) Anything I can make homemade I love to do. Let me know how you like it when you do Karen! I never knew that there was fresh cream butter until I was an adult. I would help my grandmother churn milk every Saturday morning. She would let her cream from her dairy cow “clabber” a couple of days on the counter for churning on Saturday. Different homes along the road all churned their own butter and sold what they couldn’t use. What was interesting was everyone produced a good but different tasting butter. I guess everyone had different critters floating through the air. My grandmother was very careful to scald and clean her buckets and pans everyday. She produced a delicious light butter that was always in demand. The flavor also depended on what your cow ate. You could always tell when the cow was let out to pasture for the first time in spring. I’m glad to know that food is still important to people and knowledge is not lost. Hi Karen – What fantastic memories! I’m glad to know food is important to people too. Thank you for sharing great illustration and instructions … My Household do all of the above with LOCAL Grass Fed Jersey milk ! and it’s delish and healthy! Oh, my goodness! You have just made my day! One question though…we usually leave our butter in a butter dish on the counter and the extra in the fridge. How long can it sit out before it is no good? My dad used to make homemade butter on our farm in Iowa, I always disliked butter because his was so sour. But now I love the taste of butter. He also added a butter color to his, but it was very strong. As for the butter going bad, it sounds like it may not have needed to be washed more. Any traces of liquid left within the butter after making will cause it to go back faster. Also, since it has not preservatives, any cross contamination will grow faster than normal. (Like if you get bacteria from other food in there from a knife while using) So it could have been either of those things. Mine usually lasts 3-4 weeks in the refrigerator. I have never had mold, but I have had it get an off flavor before that time. Can I use kefir instead of buttermilk? I’m not sure if kefir has the right cultures to work. I have never tried it and none of my books suggest it. You could certainly give it a try. Let me know what happens. I just finished making my first batch of cultured butter. It was so easy and so much fun! The taste of the butter is incredible. Thank you for sharing! So glad you enjoyed it Judy! 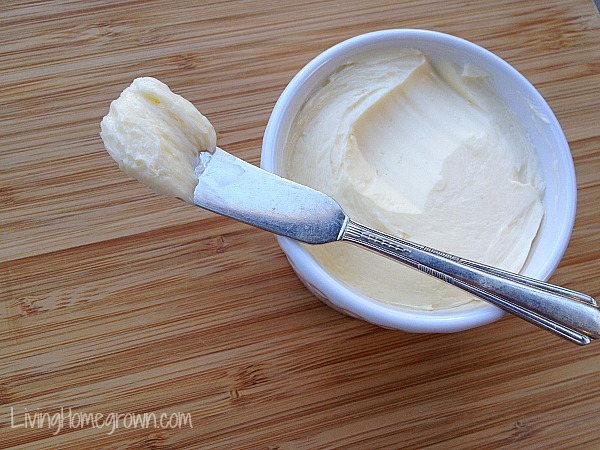 I made fresh cream butter with my mother as a child when we lived on a horse/cattle ranch. We bought fresh milk daily from the small farmer-owned dairy down the road. We dipped for it out of the giant stainless steel milk tank into gallon pickle jars. It was fresh and sweet milk from pasture feed cows that produced high cream content. Oh the memories! Please keep these articles coming! Love your podcasts, too! Living here in Alaska, room temperature is relatively colder. What do you define as room temperature? 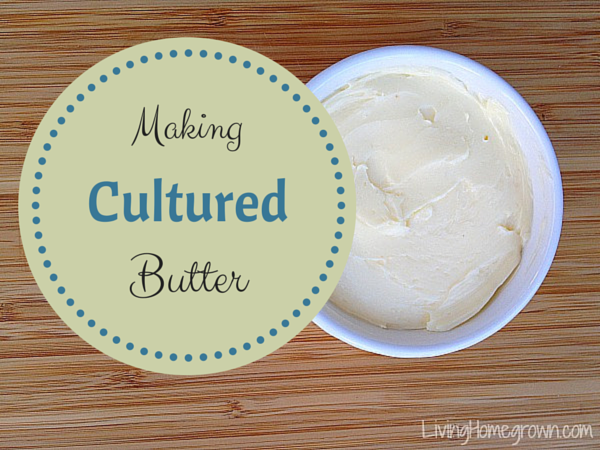 Did you include the process for making cultured butter in a podcast? I thought for sure that I heard but now can’t find it! Thanks! !